How do I deactivate F1 and F10 keybindings in gnome-terminal? How can I turn off the F1 (help) and F10 (notifications menu) key bindings? First one I need for screen utility and second to exit mc in console. There are no such key bindings in the Keyboard Shortcuts system settings. 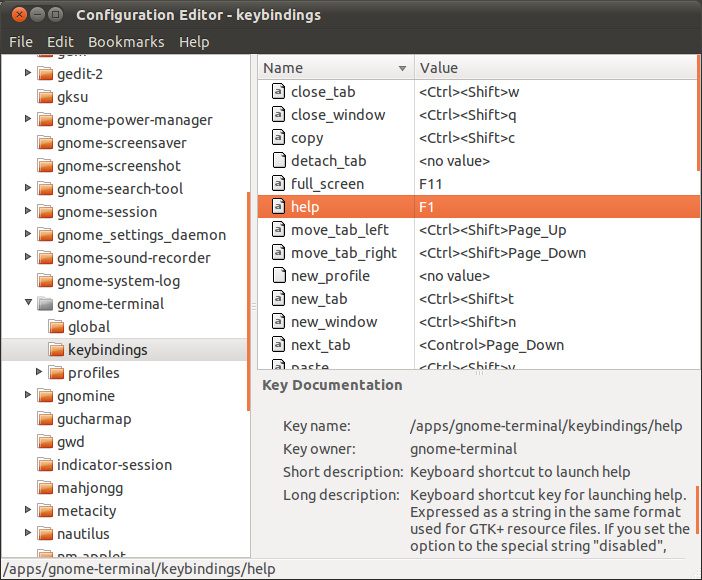 In a gnome-terminal open up Edit ➜ Keyboard Shortcuts. Warning: What are some of the issues with CCSM and why would I want to avoid it? Open up CompizConfig Settings Manager. Hit Super to open the Dash, type "Compiz" and hit Enter. 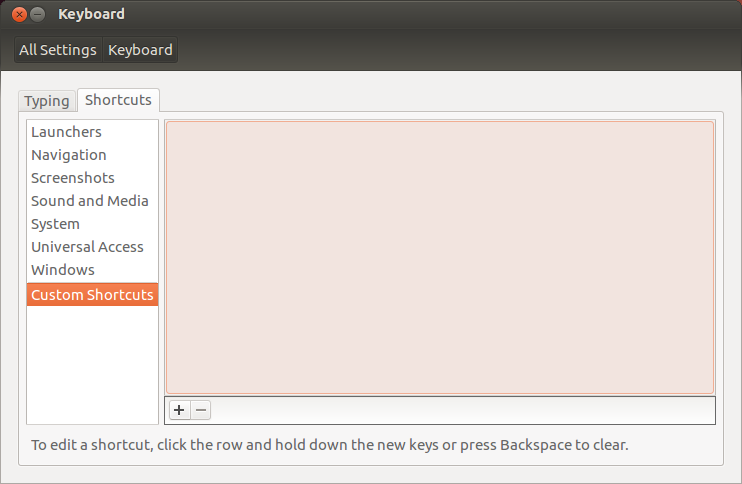 Type "unity" in the Filter entry and select the Ubuntu Unity Plugin. Click the button to the right of Key to open the first panel menu and uncheck the Enabled checkbox. F10 is mapped to menubar_accel by something in Ubuntu. Gnome? Metacity? Not sure what exact thing it is that steals it, but the key doesn't make it to Eclipse. Then close all terminal sessions. Now it should work as it should (in mc for example). "Keyboard shortcut key for launching help. Expressed as a string in the same format used for GTK+ resource files. If you set the option to the special string "disabled", then there will be no keyboard shortcut for this action." gsettings set org.gnome.desktop.interface menubar-accel ""
With dconf-editor it can be found that the F10 is really gone. Note that these kind of tricks seem to be highly Gnome / Ubuntu version dependent. @kholis is correct for disabling F10 in Unity, but if you're a newb like me, you need a little more information to make this work. Start the newly installed settings manager, and filter for "unity"
Edit "Key to open the first panel menu" to disable it or change it to another key. I have not yet found a way to change F1. How can I configure Unity? Create a new shortcut. Name it 'do nothing', and write 'false' (without quotes) in the "command" field. Push ok.
Scroll to the bottom of the list and find your new command. Click on the "Disabled", on the right, and push F1. You can easily disable it using CCSM ( Click to install if you don't have it installed). 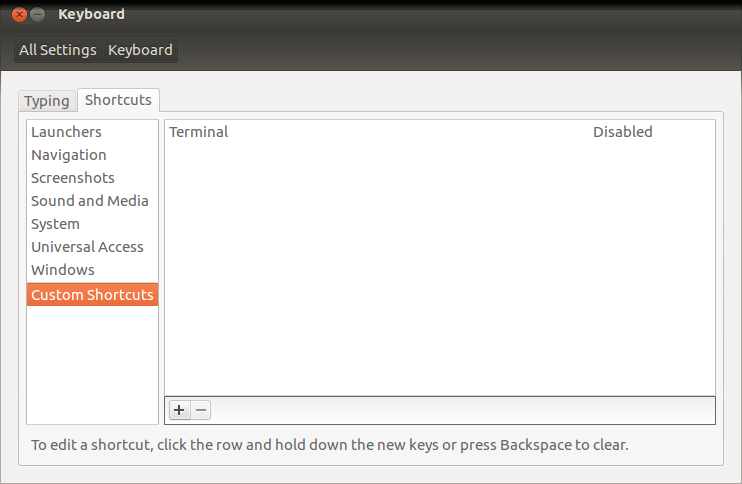 Then Go to Desktop --> Ubuntu Unity Plugin --> Key to open the first panel menu and disable it, or change it to another keyboard shortcut. Note: it seems that this method does not work in Unity2D. This is a tip for Thnkpad users, especially T60. Remap the F1 key to escape. This eliminates the annoying popup of terminal help when you hit F1. You often do this becasue of the funny placement of ESC on T60s. If you only want to change this in Gnome Terminal you can click Edit>Keyboard Shortcuts in the Terminal. I recommend using F1 as a shortcut for something else. I run Tilda, a quake-style command line terminal, and the default shortcut is F1. It overrides Help, so I never have Help launching when I hit F1. Even if you don't like Tilda much, hitting F1 again to hide it is much less tedious than closing Help after accidentally launching it. So in response to the specifics of the question, there's no need to disable help and notifications. Mapping hot-keys in 12.04 is simply accomplished through the Keyboard widget. In the Unity launcher find keyboard. In the window that opens select the shortcuts tab and custom shortcuts. Click the plus to add a new shortcut. Name it to whatever matches the functionality you're assigning it. Enter the command you want it to run in command. At the right side of the window click where it says disabled. This should toggle to New Accelerator. The Custom Shortcuts accelerator you defined overrides the Right-click simulation behavior. You could set this the command to echo 'nope' > /dev/null if you just want your F10 to do nothing. I have installed Ubuntu 12.04/64 and have completely removed Unity from it following these directions.. Many of the tools that modify the behaviour of Unity, therefore, don't work. In particular CCSM no longer "sees" the keyboard shortcuts. I found that the method using Edit->Keyboard Shortcuts in the terminal window also didn't work. After a bit of playing around I found that looking farther down the Keyboard Shortcuts window in the Shortcut Keys section, F1 and F11 were still defined to their respective shortcuts. Click on the "F11" in the right hand field of the line that defines F11 as Fullscreen. The text will change to "New Accelerator...". Type some other, less objectionable, key sequence (like alt-F11) and that key combo will replace the shortcut. If someone knows how to type "nothing" please let us know. Repeat for the F1 key. Ctrl+F1 doesn't work either. The solution is the same as for Shift+F10. Don't forget the semicolon as separator! Not the answer you're looking for? Browse other questions tagged shortcut-keys gnome-terminal or ask your own question. 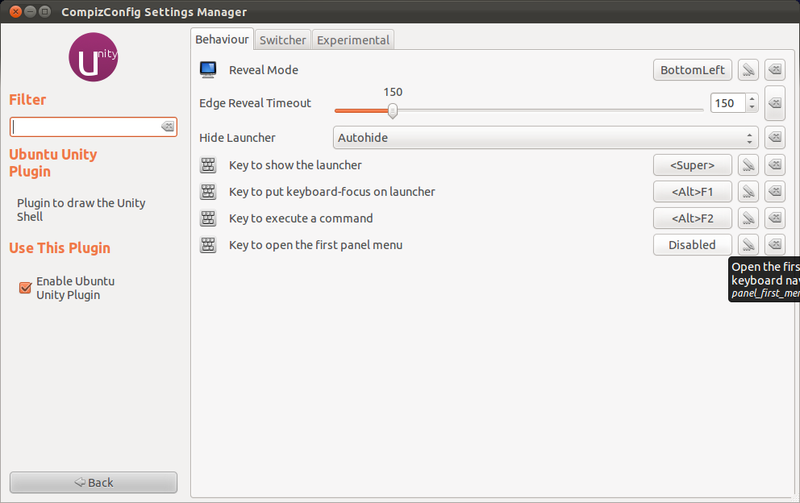 How do I disable the F10 (application menu) keybinding in Ubuntu 11.10? What are some of the issues with CCSM and why would I want to avoid it? 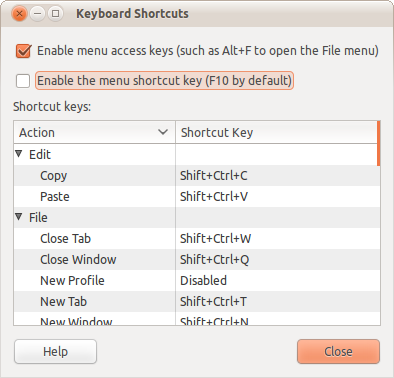 How do I get keyboard shortcut working for maximise in gnome-shell?